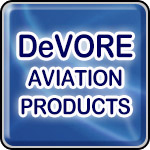 DeVore Aviation Corporation is an aviation manufacturer with extensive engineering and manufacturing capabilities. DeVore's focus is primarily on aircraft lighting systems (external as well as internal), recognized worldwide through our line of Tel-Tail vertical tail floodlights. Additionally, we manufacture a line of Forward Facing Recognition Lights (FFRLs), main rotor illumination lights and fuselage floodlights for helicopters. Pulse Light Approach Slope Indicator (PLASI) systems are a visual approach aid for use in visual flight conditions. The system provides the pilot with a stabilized approach by means of a single light source from a position adjacent to the intended touchdown point of a runway or helipad. The PLASI system has an effective visual range of 5 nm during the day and up to 20 nm at night. A pilot who is flying the approach on glidepath will see a steady white light. If he should stray above glidepath, he will see a pulsing white light. Alternatively, if the pilot begins to descend below glidepath, he will first see a steady red light, turning into a flashing red light the lower he goes. PLASI systems are self-contained units, requiring no extra equipment in the aircraft to utilize. The HAPI-PLASI system for heliports comes mounted on a rotating turntable, thus providing the approaching helicopter pilot the ability to position the unit (via a ground or aircraft controlled radio) to capitalize on wind direction and/or minimize noise impact. PLASI units for airport, heliport, temporary and tactical (infrared) operations are FAA (PLASI 2000 and HELI-PLASI) and ICAO (HAPI-PLASI) approved and are readily transportable and easily installed. To date, over 500 units have been installed world-wide.